The major international networks of Social and Solidarity Economy and Finance (SSEF) have commited to an Inclusive, Resilient, Low Carbon and Sustainable Local Economic Development (LED). Meeting in Praia, Cabo Verde, on the occasion of the 4th World Forum for Local Economic Development, the SSE International Forum, the Global Fund for Cities Development-FMDV, the Global Social Economy Forum-GSEF, the International Association of Investors in the Social Economy-INAISE, the Intercontinental Network for the Promotion of Social and Solidarity Economy-RIPESS, and their regional and local interlocutors, the African Network of the Social and Solidarity Economy-RAESS, and Citi-Habitat, commit to a transformative agenda for local economic development (LED) in our territories. The joint motto: for Inclusive, Resilient, Low Carbon and Sustainable Local Economic Development (LED), Let's implement a Social and Solidarity Economy and Finance (EFSS) now! For the first time, through a common text, the international networks are committed to proactive collaboration around a joint agenda, which will bring powerful actions until 2019. The Praia Manifesto takes stock of the historical cultural, institutional and legal advances that the SSEF has experienced in recent years. Economic and financial crises, climate change, new international "transformative" agreements, laws and public policies deployed by many countries, cities and regions, citizen mobilizations, the advent of new technologies, revalorization of disruptive and resilient SSEF innovations: so many factors today to achieve the metamorphosis of our systems of consumption, production, capitalization, investment, redistribution, cooperation, and thus to ‘build a society’ by and for all. The signatory networks are taking the measure of the historic turning point that the SSEF initiatives have designed: the transition made necessary to a "macro" SSEF, able to propose a project of society, institutions, mechanisms and implementation modalities, adapted to meet the challenges posed to humanity, while maintaining the basis of its principles which constitute its absolute value. the World Forum for the Social and Solidarity Economy of Bilbao, in October 2018, supported by all the networks of the EFSS and the networks of local and regional authorities, the International Conference on the Financing of the Social and Solidarity Economy, planned for the end of 2018 / beginning of 2019, led by the International SSE Pilot Group; The 5th World Forum for Local Economic Development of 2019. 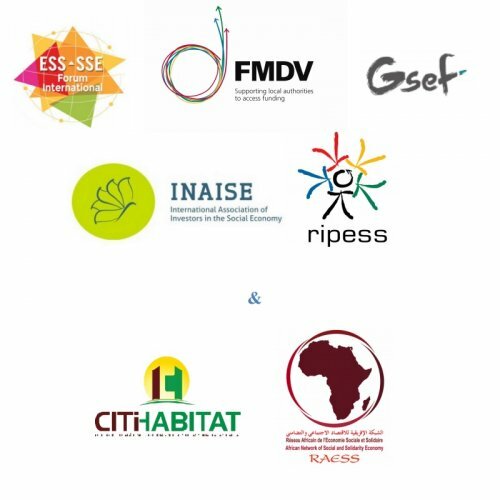 Committed to the decentralization, localization and pragmatism of their actions, and considering the organization of the LED Forum for the first time in Africa, the signatory networks pledge to support the steps being taken to integrate the EFSS on the African continent, through support for the work of the RAESS- African Network for SSE, as well as the Cabo Verde government, the country's SSEF organizations, and its economic and financial players, in their approaches to institutional and programmatic convergence and operationalization of the SDGs at the national level via the SSEF. Through the Praia Manifesto, invitation is made to all public and private, local and international actors, to engage in this partnership for change, and around a common agenda that will make the SSEF the reference economy and finance for a shared, accountable, resilient and inclusive prosperity for all. CCEDNet is an active member of RIPESS, the Intercontinental Network for the Promotion of the Social Solidarity Economy, and Board Secretary Yvon Poirier from Québec City helped plan the Forum and draft the Manifesto. You will find the text of the manifesto and its executive summary here.